Because I have come originally from Yalta, I go back to Crimea regularly. After 15 years living in the Netherlands, I miss the mountains and the sea the most. The first thing I do in Yalta is swimming in the Black Sea and then take a relaxing hike in the woods. Every time I'm there I always try to visit new places and experience something else. 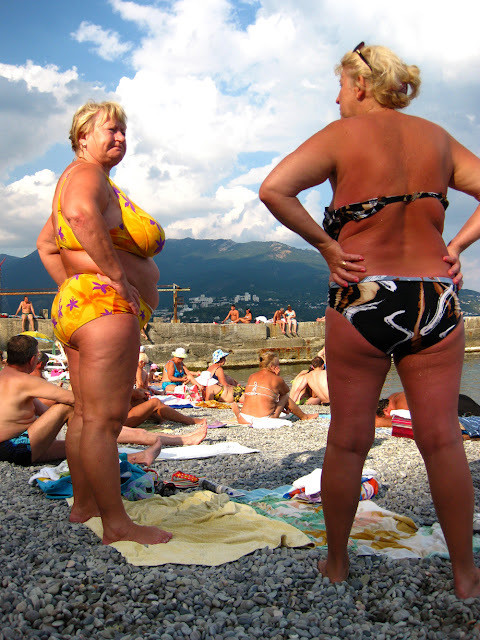 Yalta itself is a small town, but very popular among the tourists who visit the Crimean peninsula. At first impression this seems very doubtful tourist center. Its superficial entertainment and a lot of kitsch nuances are making it difficult sometimes to find the real city. But with a little searching you can have great food, enjoy the sights or just lazing on the beach and let all the tourist traps behind you. In the past Yalta used to have a very limited number of hotels. Nowadays the choise bacame greater and so are the price rangers. And yet it is much cheaper, easier and more popular to rent an apartament. The offer is huge, so choosing can be difficult. The last two times I was there I lived in a neighborhood on a hill where the air is much better than in the center and which is overlooking the city, sea and mountains. I was content with this place because from there everything is within walking distance and you won't have to bother with the crowds and traffic that occurs in high season. It is a standard Soviet apartment with a living room, bedroom, kitchen, bathroom and toilet. The apartment is clearly just renovated because everything looks new and neat and the interior is very minimal, but with all the basics. There is a refrigerator, washing machine, TV, sofa, iron and a wonderful bed. From the apartment to the center are two trails. The first one is a short walk down the hill and you're right at the sea and the second one is through the market with fresh local delicacies. The market is a great place that shows what the locals eat and what fruit and vegetables are a must to try. My two favorites this time were the fig and the local berry cornus (кизил). Crimean kitchen is a variation of Russian, Ukrainian, Georgian, and Tatar dishes. This is widely available. It is tasty, but fairly one-sided and there is almost no choice for vegetarians. But there are also places where European cuisine is offered or Asian for the fans. Also there are nice restaurants with fresh food directly from Crimea, such as fish, mussels, vegetables and fresh fruit juices. The market is a great place to eat. The restaurants look terrible, but everything is freshly prepared and you know that the products come directly from the market. The menu features Tatar dishes and many drinks except spirits. But it is possible to bring own bottle of spirit and drink it there. Good place where they serve delicious Thai, spicy food and sushi. The location of this restaurant is very nice, right on the beach. Here you can enjoy the Asian atmosphere and pleasant sea air. This place has been around since I can remember and is still doing very well because their kitchen is very simple, traditional, tasty, fast and very cheap. Do not be afraid to walk in here, it looks very doubtful on the outside, but it's so good! This cafe was a pleasant surprise for me. I walked past it almost daily, but only after advice from friends I decided to have a lunch there. 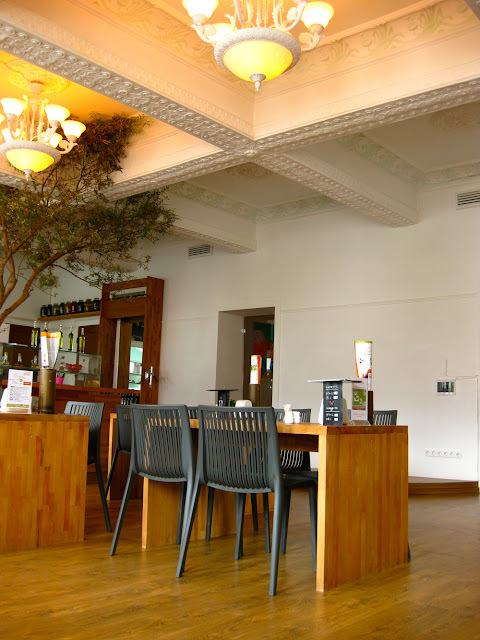 It's a very relaxed eatery with modern furniture and lounge music in the background. The staff are very helpful and even speak English, which is very special in Yalta. The dishes are very diverse, fresh and tasty. There is a variety of fish and seafood. This includes a free glass of white wine. For dessert there are homemade cakes and a delicious fresh juice of cornus berries. And it is also quite cheap! This cafe / restaurant is a great place to go any time. On weekends it is a little busier, but has a cozy atmosphere. At the end of the hall is always a music DVD on a big screen, which you can watch or just listen to. The music is never too loud, so you just can have a good chat with friends and enjoy drinks and snacks. The menu is very good and comprehensive. There are all kinds of drinks and snacks are delicious! For people with a serious hunger there is enough in the menu to find aswell. This is an Italian pizzeria chain here in Yalta. Apart from this address there are two others. But I found this one pleasant enough so I did not need to visit other Capris in Yalta. The menu is very simple, there are all kinds of pizzas, salads and pastas, and that's pretty much all they've got. But the dishes are very well prepared and quickly served. This is a simple, quiet eatery on the beach, with an extensive menu. Here they had everything season had to offer: various salads, appetizers, soups, fresh fish, meat and so on. Not much to say, just a pleasant place with a sea view and good food. Just outside Yalta is Livadia. Easily accessible by foot or a marshrutka (a mini bus). Livadia is much visited because of its rich history. The last Tsar, Nicholas II, rebuild his summer residence in Livadia which was celebrating its 100 year anniversary last september. Sadly enough the Tsar and his family spend just four seasons here before their arrest by Bolsheviks. 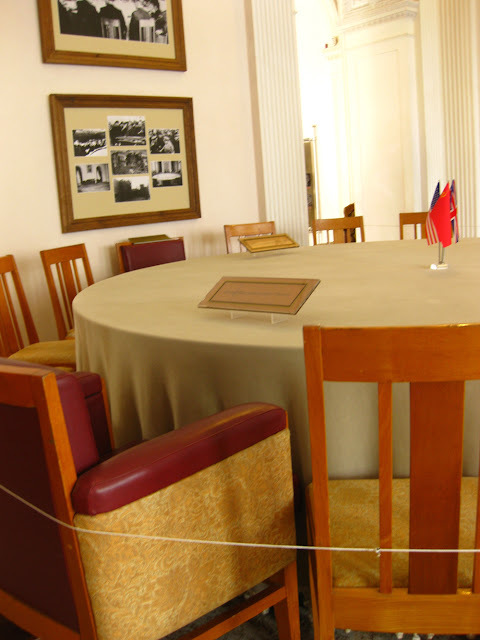 Just after the Second World War the palace was used for the well-known conference with Roosevelt, Churchill and Stalin. A visit to Livadia palace is a special experience. Not only for its beautiful surroundings and Italian Renaissance-inspired architecture, also for the history that you can clearly feel and can imagine very well how the events took place here. The white hall on the ground floor takes you back to the 'Big Three' talks. Above shows how the last Tsar's family have celebrated their holidays in Crimea. Another special reason to go to Livadia is the Sunny Path. Nicholas II build this trail for his healthy regular walks outside. It starts right at the backside of the palace in the gardens and ends 7 km later near Swallow's Nest. I've been told that a part of this path has a special energy zone where people can recharge themselves. I have not felt the energy, but perhaps I got it, because walking on the Sunny Path was easy and very enjoyable. The most beautiful part of the walk is Oreanda area, which can be recognized by the large white columns overlooking the sea at the edge of the path. Here is also where the Romanovs had have their first palace in Crimea. Unfortunately the palace was burnt down. Last year I had an intention to dive in the Black Sea, but it seemed impossible to find a decent diving school. 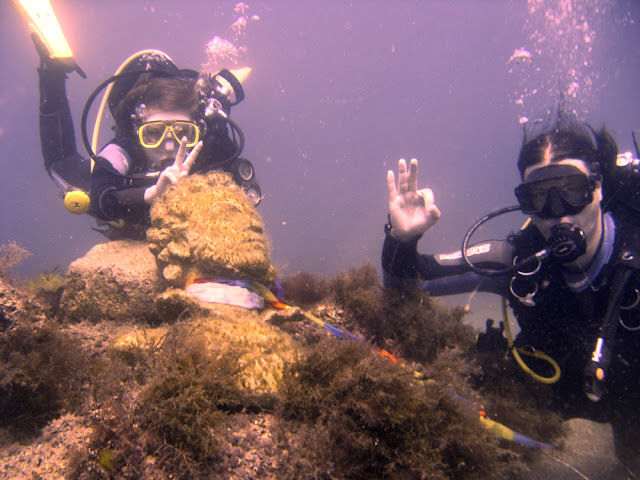 Each offer was a simple underwater excursion for inexperienced tourists. But this time the son of a friend helped us and brought us to the place in Alupka where proffessional divers from all over Ukraine gather together to explore the underwater world of the Black Sea. That was a strange experience, I must say. 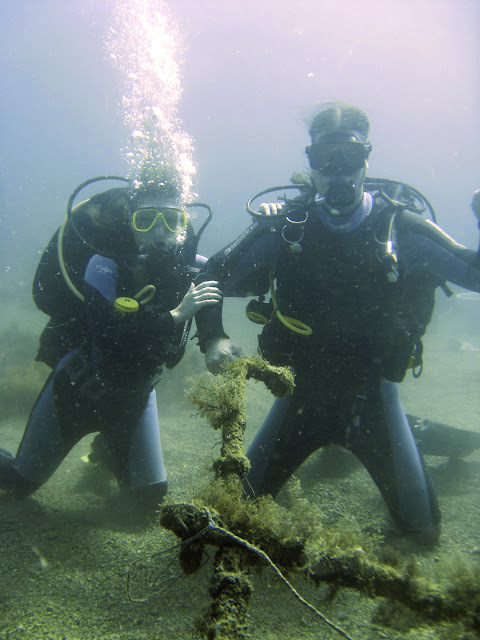 During each dive we learned how to prepare our own stuff independently. Here it was seen as an additional service to get everything ready for you. I did not even have to put my wetsuit on myself. At the end of the preparation I had enough of it and decided to set up my mask on with my own hands. Yes, I was that recalcitrant. What we saw underwater was not very special. Larger animals such as dolphins and sharks are too shy to come near divers. On our route were some small, curious fish, small caves and a tourist spot with toilet bowl and a Pushkin bust that is intended for 'fun' snapshots. You need luck to encounter special creatures. 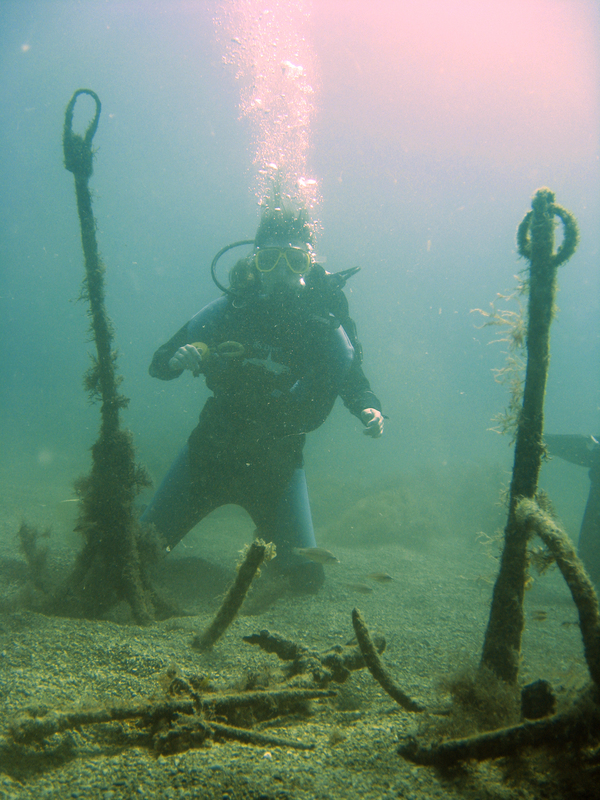 Or determine another route where the war wrecks can be seen. Something we will definitely do next time. Explore the areas outside Yalta is fun and easy. A special way to do so is with a boat which goes via Swallow's Nest to Alupka (Vorontson Palace) or to Gurzuf. Both take about one hour to one way. We went by boat to Gurzuf and back to Yalta by bus. The road along the sea is very beautiful, you see the Crimean coast from a different perspective. First you sail past many vineyards and Nikita's Botanical Garden until a more rocky area approach, thats where Gurzuf begins. This shady, rocky beauty attracted and inspired many artists like Alexander Pushkin, Anton Chekhov and Feodor Chaliapin. Gurzuf is just a small town, but you can stroll along the promenade, visit the houses of Pushkin and Chekhov or just go swimming. The Crimean peninsula has so much to offer, I never get bored. There will always be plenty to see for the next time I get there. This time Balaklava has been my preference. Public transportation from Yalta to other places is very efficient. Many buses run frequently and on time. Balaklava is only slightly less easy to reach. The sad thing is that you must travel through Sevastopol while you practically drive through Balaklava. In Sevastopol, you have to change the marshrutka twice and then you are finally there! This little spot is known for its beautiful bay surrounded by hills once used for top secret Cold War manoeuvres. From the seaside, the bay is almost invisible. This has been an ideal location to pirates (Homer mentioned Balaklava in his Odyssey), British navy during the Crimean War, Genoese nation, Soviet nuclear submarine base in the Cold War and now it serves as a multi-million dollar yacht harbor. 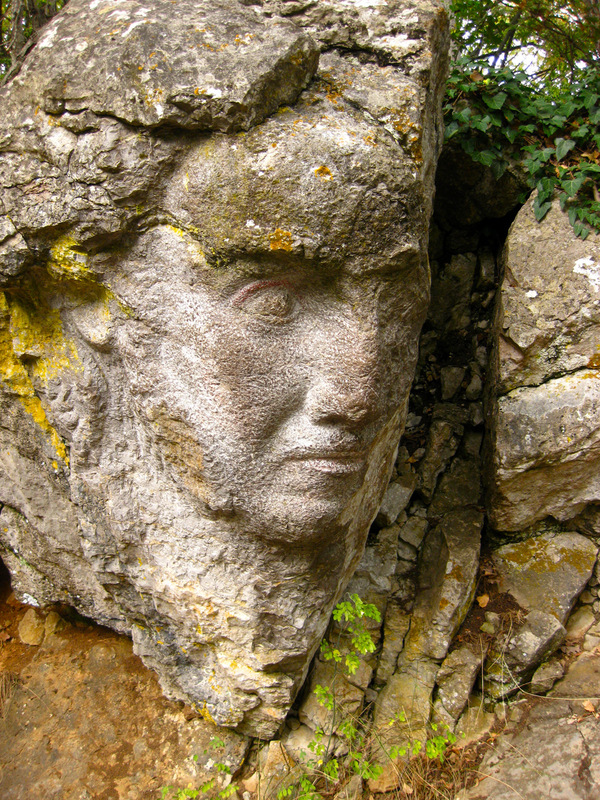 The oldest surviving reminders of history is the 15th century Genoese Fortress of Cembalo. And the latest is of course the former nuclear submarine factory which is a museum now. 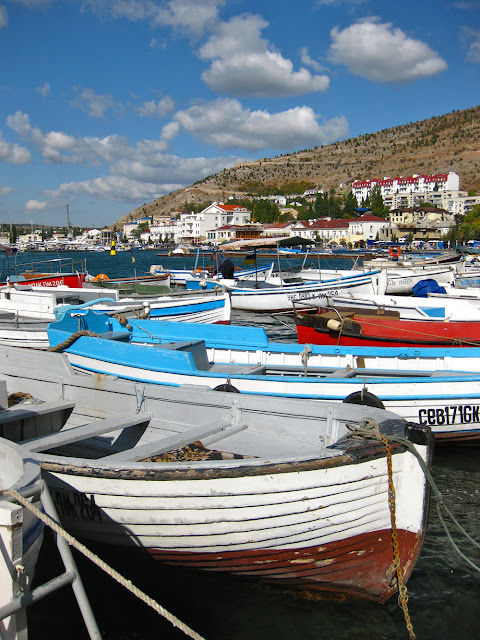 For a general impression of Balaklava it's worthwhile to do a boat trip along the bay. First you sail past the hill where the Soviets performed their secret plans. There is a clear submarine entrance, leading to endless corridors within the hill. Then you look out on the 19th-century ruins, the former homes of the royals. The Genoese towers overlook the bay all the time. Once in the open sea, the bay seems to have disappeared. The mountainous landscape is all you see now. The hills surrounding the bay can be hiked. On top, next to the old towers the view is just phenomenal. This place offers a bird's-eye view of the cove and the Black Sea. 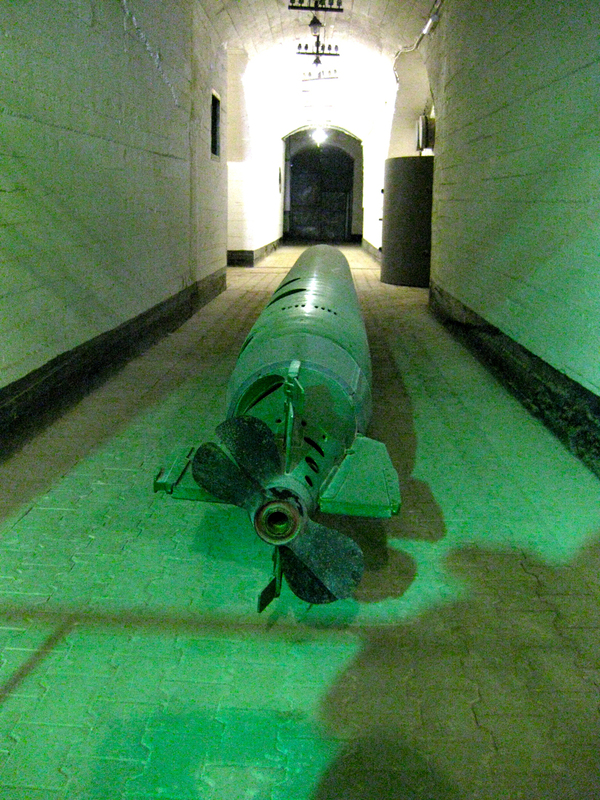 The most interesting, or at least the most bizarre was the visit to the naval museum. The original entrance for submarines is also the entrance to the museum. 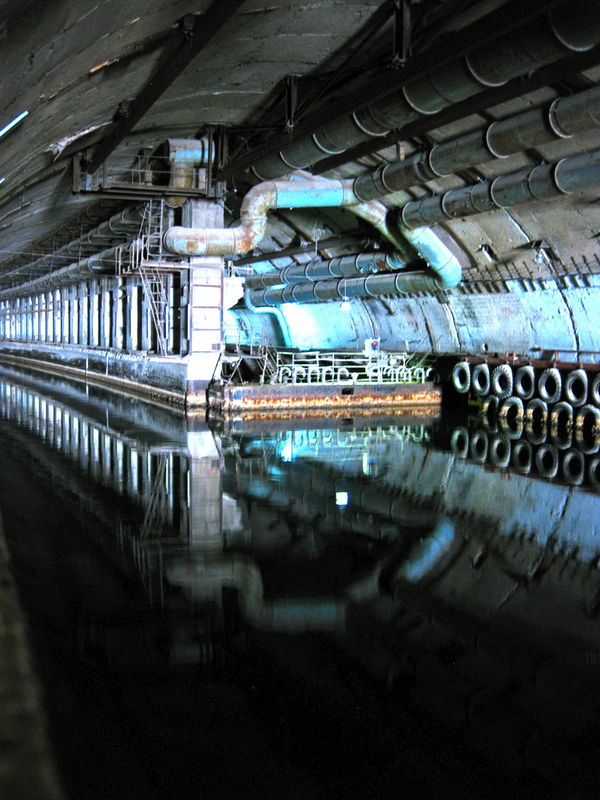 From there you take a long walk along the water tunnels and corridors. Huge nuclear-blast-proof doors, repair docks, mess rooms and arsenal bring you back in the paranoid times of Cold War. So this is what I have done in September, inbetween my appointments at the beauty salons. Amazing blog nice photographs keep it up thank you. A vegetarian traveler from Yalta.